The Committee and volunteers are already hard at work putting together the details for this year's Heckington Show. Already in place is an action packed Main Ring Programme, featuring National Grass Track Cycling events including Penny Farthing racing and Horse Boarding! And due to the oversubscribed 10 Mile Road race last year, we are putting plans in place to accept even more entrants this year! Look out for more updates as they become available. The Committee & volunteers of the Society would like to thank everyone for their amazing support in what has been a very challenging year. With hard work and commitment from of all our volunteers, particularly in dealing with the extreme weather conditions, we have managed to hold a wonderful show for our visitors. We extend our thanks to all our traders, participants and exhibitors for their patience and understanding and our visitors for coming and supporting us ! ​Heckington Show receives Queen's Award! Heckington & District Agricultural Society have been awarded the Queen’s Award for Voluntary service. It is the highest award given to local volunteer groups across the UK to recognise outstanding work done in their own communities. Created in 2002 to celebrate the anniversary of The Queen's coronation, it is the MBE for volunteer groups. It is a tremendous recognition of the truly exceptional dedication and service of the whole Heckington Show team and a tremendous honour for us all. ​10 Mile Road Race Fully Subscribed! We are very pleased to announce that as of 12th May, the 10 Mile Road Race is fully subscribed with no more places available for entrants. The number of entrants was increased due to demand this year to 300 and we have filled these places in record time. Be prepared for a very exciting race this year, with special prizes for Heckington Residents. To celebrate the 150th show, Heckington's very own 8 Sail Brewery have produced commemorative pint beer glasses with their own logo and the show's 150th rosette. These are available from the 8 Sail Brewery on Hale Road, Heckington - next door to Heckington's 8 sailed windmill! As part of our 150th Show celebrations, we are pleased and proud to have been chosen by British Cycling to promote not one but THREE National Grass Track Championships. We are organising both the men's and women's 800 mtr championships and the men's 8 km championships. This is the first time three National Championships have been held at the same venue in one day – and recognises the fact that Heckington has become the number one Grass Meeting in the UK. We are very pleased to announce that from the 150th Show onwards, we are increasing the age at which children are eligible for Junior Tickets. Previously junior tickets were available up the age of 15, but we are now increasing this to include 16 & 17 year olds, meaning that you don't need to pay full entry price until you are 18 & over. Even more reason to visit Heckington Show in its 150th year. Thank you to everyone for their interest in the 150th Celebration Ball tickets - the demand was exceptionally high and the 450 tickets sold out within a very short period of time. Apologies for anyone who was not able to obtain tickets for this one-off anniversary ball to celebrate the 150th Show. 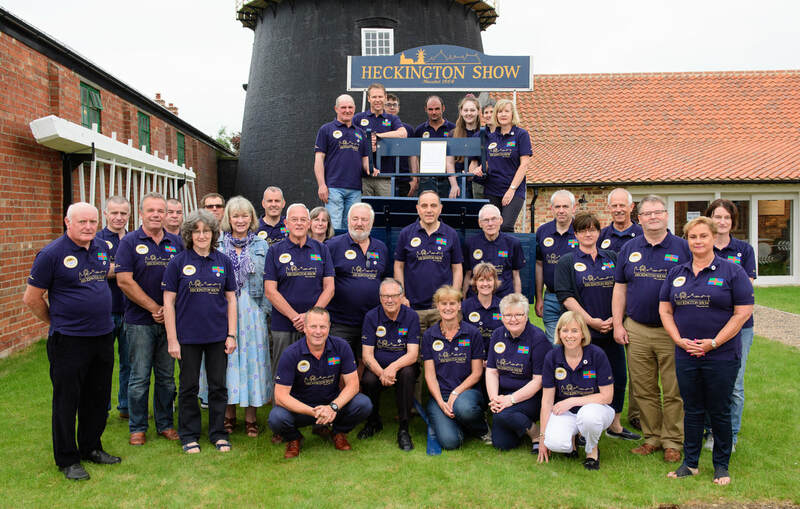 As part of the 150th anniversary of Heckington Show this summer, a Celebration Ball is to be held in the Show Grounds in Heckington, the week after the Show - on the evening of Saturday 5th August. Further details can now be announced. The live band entertaining on the night will be ‘The Big Time Fun Band’ – a seven piece group incorporating the members of ‘Waterloo Live’ who wowed the arena audience last year in their Abba show as part of the fireworks concert. As well as an Abba section the band will feature popular songs from the 70s and 80s. Incidental music will also be provided by the Tennyson Collective, Lincolnshire’s celebrated brass quintet. There will be a disco and a delicious three course sit down meal, with licensed bar available. The horticultural marquee will be transformed into a large, beautifully decorated space for this strictly one off event. Tickets costing £40 each will go on sale to the public soon. There has been a huge amount of initial interest and so its planned to increase the number of places at the Ball from 300 to 400. Tables are for 10 people – although people will be able to book smaller numbers as applicable. Payment will be by cash or cheque at the time of booking and tickets will be non refundable. This year is the 150th Anniversary of Heckington Show. Plans are well underway for a very special event to celebrate this momentous achievement and initial details can now be released. A 150th Celebration Ball is to be held in the Show Grounds in Heckington, the week after the Show - on the evening of Saturday 5th August. Andrew Key from the Ball Committee says ‘This is going to be a wonderful evening – a unique, one-off celebration of all that is so special about the Show. The huge Horticultural Marquee will be transformed into a beautiful setting for our summer ball. We will soon be releasing further details including confirming the live entertainment that I know will prove a real hit. People are requested to ‘Save The Date’ for what is sure to be a very popular evening. Plans for our 150th Show are already well underway with some very exciting entertainment for the main ring being planned. We are very pleased to welcome back the Monster Trucks - a pair of noisy, car-crushing Monster Trucks will perform stunts and display in the main ring on Sunday afternoon. REPLICA WW1 MARK ONE TANK FOUND ON DRIVEWAY IN CAMBRIDGESHIRE, NOW HEADING TOWARDS HECKINGTON SHOW! With a maximum speed of about 4 mph, it could take a long time and so preparations will begin shortly to make sure it arrives on time. The tank is the only full size working replica in the whole of Europe and so we are lucky that we only had to trek as far as Cambridgeshire to find it. Weighing six and a half tonnes and 21ft in length, this tank will require a very large low loader to bring it to the show and so we would suggest avoiding the Cambridge to Heckington route on Friday 29th July and Monday 1st August or think about making alternative arrangements otherwise it will be a very slow drive! It will be much easier to see the tank in the Heritage Area of the Show all weekend, and in the main ring on Sunday. Don't miss it! Announcing the main ring line-up for 2016, which includes Atkinson's Action Horses, an exciting, but terrifying display of riders performing daring stunts on horseback. Featuring horses from the stables who provided the beautifully turned out horses for the BBC's recent Poldark series. Headlining on Saturday night at the Firework Concert are an amazing ABBA Tribute act, Swede Dreamz. They will be performing all your favourite ABBA songs to get you up and dancing, and see them dressed in very best of 1970's fashion! And on Sunday we are pleased to welcome a massive 20 ton Fire Engine that thinks it's a wheelie bike! Watch with amazement as the front of the truck jumps 15ft into the air! Two performances by the Backdraft Wheelie Fire Truck will make sure that the children will want a front seat on Sunday afternoon. And don't forget all your favourites, including cycling races, National show jumping, grand parades, 10 mile road race and the children's races. So much going on in 2016, and this is just in the main ring! Plans are already underway for a fantastic 2016 Show. The Committee meets every month during the winter to make plans and start booking entertainment for next year's show. If you have any ideas or thoughts on how to improve the show, please let us know. The Heritage area are highlighting World War I to commemorate the 100th anniversary with a special marquee dedicated to WWI, including a 9ft long replica Zepplin. Also showing in the main ring are the FANY (First Aid Nursing Yeomanry) who will be providing a display with horse drawn carriages. Read Tom Wheatley's Blog here about his experience of the 50th 10 Mile Road Race held on Saturday morning of the show. Visitors turned out in big numbers on Saturday for the 2015 show. Due to the poor weather forecast for the Sunday afternoon, visitors chose to come and enjoy the show on the Saturday and a record number of visitors for one day was achieved. Despite the poor forecast for the Sunday, visitors still turned out to see the livestock, showjumping and main ring performances,with a hardy group in the grandstand staying on till the very end. It was wet and a bit muddy underfoot, but there were plenty of smiles and cheers for the performers. The UK Beach Boys entertained the crowd in the main ring on Saturday evening and had people up, dancing and singing along with their old favourites. The fireworks that accompanied Sleaford Concert Band's finale were described as "the best I have ever seen". UK BEACH BOYS PERFORMING ON SATURDAY NIGHT! Headlining on Saturday night at the Firework Concert in the main ring are the UK BEACH BOYS. They are the number 1 Beach Boys tribute act, having performed throughout the UK and Europe since their formation in 2002. They re-create the superb sounds of Brian Wilson and The Beach Boys, performing totally LIVE without tracks or artificial backing, giving a true representation of LIVE music. They are also the ONLY Beach Boys tribute to have appeared with THE BEACH BOYS. Having performed at top venues, theatres and major festivals, THE UK BEACH BOYS will set Heckington Show alive on Saturday evening! Come and watch this exciting, fast-paced event as teams battle to race their scurry's through the specially built course. Featuring in the main ring on Saturday, this is a first for Heckington Show with some fantastic photo opportunities to be had. We are very pleased to be hosting two National cycling events at the 2015 show. The 8k Endurance Grass Track Series and The 800m Short Distance Grass Track Series. More details to follow. Plans are already underway for a fantastic 2015 Show. The Committee meets every month during the winter to make plans and start booking entertainment for next year's show. If you have any ideas or thoughts on how to improve the show, please let us know. 2015 also marks the 50th anniversary of the 10 Mile Road Race. An extra special race for 2015 is being planned. Heckington & District Agricultural Society Annual General Meeting will take place on Wednesday 10th December at 7.30pm at the Methodist Chapel hall, Heckington. The 2014 Show was a record breaker in more than one area. The wonderful weather over the weekend meant that our Sunday visitor numbers were the highest ever for a single day, and we found parking for everyone! The Livestock area had a record number of 420 entries in that section on the Sunday and the Horticulture section had 430 people enter over 2500 exhibits! And not forgetting the Children's races, which have over 150 children enter. Let's see what 2015 brings! Whew, what a scorcher! I’ve never known it so hot in the Heritage Marquee, yet we all managed to carry on – just! Undoubtedly, the stars of the Show in the Heritage Arena were the First Aid Nursing Yeomanry – the first time we have had horses performing in the area. More people than ever seemed to fill the area, enjoying performances by the American West, City of Lincoln Waites, Boston Veteran Bicycle Club and the Knights of Skirbeck. You could have made – and many children of all ages did – a corn dolly, a pot, a tile or a traditional canal boat dragonfly. A big ‘thank you’ to all our exhibitors – all 44 of them – for helping to make the area one of the star attractions of the Show yet again! The Denman Cup is to be awarded in the Youth Athletics section. The Cup has been presented to the Society by Catherine and Zena Denman in memory of their father, 'Jack' Denman (1916-1995). The Oxby Cup - will be awarded in the Heavy Horse section for the Agricultural Turnouts Class. This has been given in memory of the Oxby family who were heavily involved in the show in the past and were great lovers of Heavy Horses. Trade stands bookings have been coming in fast and applications are now being placed on a waiting list for available space. To ensure you get a space at this year's show, applications should be made as soon as possible via the website online page. As soon as space becomes available you will be contacted with availability for this year. We have a large marquee in which we hope to have health and beauty type stands and welcome enquiries from individual specialists. We envisage this to be a collection of local therapists who specialise in individual treatments or therapies. Stands will be restricted in size to allow the maximum number of individuals within the marquee. It is anticipated, each stand will be allocated a 10ft x 6ft space. Public liability insurance is required. To enquire about space in this marquee, please email tradestands@heckingtonshow.org.uk with full details including name, contact details and therapy/treatment offered. You are more likely to be accepted if you focus on one treatment/therapy rather than offering several at the Show. We are anticipating a lot of interest in this area and will carefully select a balance of traders to ensure the best experience for our visitors. Cambridge Hands On Science Team will be with us again this year providing wide ranging hands-on science experiments. With enthusiastic student volunteers explaining what each experiment shows and why it's interesting! The two headlining acts for the Main Ring for 2014 have now been confirmed. On Saturday we are very pleased to welcome the Stampede Stunt Display Team who are a group on horseback providing an exciting and daring display of stunts, together with a Medieval Jousting competition. On Sunday we welcome back the J C Balls & Company Dancing Diggers. Watch the diggers go through their paces with gravity defying stunts. The Society held their AGM on 11/12/13 which was very well attended with over 30 Committee and Society members present. A new President of the Society was electred - Mr Alan Stennett, well known Lincolnshire historian and writer.After the AGM there was a short film from the archives showing scenes from Heckington Village and the Show. What a superb show we had this year, with a record of over 32,000 visitors attending. The weather stayed fine and whilst it was a bit damp and misty for the firework concert, the main ring was as packed as ever in the evening. We have received many comments and notes of thanks from across the country and we are already working hard on making plans for next year's show! If you have any comments or questions about this year's show or suggestions for next, please fill in the form on the home page, and we look forward to seeing you again in 2014! Winning Answer: NEW TO VILLAGE! EVERYBODY TALKING! MUST SEE SHOW! WOW! Winning Answer: SUCH A BIG, WONDERFUL EVENT IS ON OUR OWN DOORSTEP! Question 3: 'The Heckington Show is special to THE VILLAGE because...' is Phillippa Blackbourn, of Heckington. 19/07/2013 - TV's Dancing Dog to appear at Heckington Show! Lucy and Indie, the four-year-old border collie, wowed the celebrity panel with their high-energy routine to Footloose, which was put together in just one week, with Indie performing flips off Lucy’s body, running between her legs and walking on her hind legs.The pair were named the winners by the studio audience and received rave reviews from judges Bill Bailey, Britain’s Got Talent winners Ashley and Pudsey and Sharon Osbourne, who gave the pair a standing ovation. See them performing live in the Concert Marquee at this year's show. 15/07/13 - 10 Mile Road Race Full! We have recently had confirmation that the Hurricane and Spitfire will be performing a flypast over Heckington Show on Saturday evening at around 7-7.30pm. This will take place at the beginning of the Firework Concert and make a fabulous start to our 150th Anniversary Concert! Don't miss out - get your tickets for what promises to be a fantastic weekend! It is 150 years since the first Heckington Show took place. The scene is idyllic as ever it was – leafy trees and green fields in the shadow of St Andrew’s Church. And whilst the scale of this show in 2013 is in a different league, part of its charm is that much of the character of those early village shows remains intact. In fact it’s something you can really experience - in the horticulture marquee and livestock area or the athletics and cycling races which attract both local children and national competitors. Then the similarities end – and with some drama in the main ring. The 2013 programme is guaranteed to have some of you unable to watch, with the aerial gymnastics of the Vander Brothers Quad Wheel, the Kangaroo Kid’s magical motorcycle stunts and even a troop of Roman Cavalry riding out to keep us Britons in order. Saturday’s programme culminates in the Grand Firework Concert starting at the earlier time of 7pm with great music to entertain and inspire. Solace is on tap though – 60 acres of shops, stalls, demonstrations and food as well as the popular concert marquee – this year embracing the winner of TVs That Dog can dance. Keeping all the family engaged for the whole weekend is never a problem at Heckington. Why not learn about medieval weaving or preserving war memorials in our heritage village? Or perhaps you prefer to pick up some dinner party ideas from the Boston College cooking demonstrations or try your luck in one of the many competitions – with categories suitable for all ages and ranging from cookery and crafts to art and photography. It’s all too much to cram in one short article – but just right for one packed summer weekend. Entry forms and schedules of events are now available online. Booking forms can be downloaded and printed for all events and there is the facility to enter the 10 Mile Road Race, or make a Showjumping or Heavy Horse entry online. See Individual Section pages for more information or follow the Do It Online link. Heckington & District Agricultural Society celebrated its 150th Anniversary with a special event at the Queens Head at Kirkby la Thorpe on Friday 10th May. Over 70 past and present members and helpers of the Society met for a celebratory dinner in recognition of the 150th year of the Society. Whilst the 150th Show is not for another 4 years, the Society itself has been running since 1863 - the difference being explained by the show not being held during the war years. A toast to the Society was proposed by Alan Stennett, well known Lincolnshire broadcaster and writer who has been coming to the show for over 60 years. Pictured are some of the members who attended the anniversary dinner. Tradestand bookings are now being taken online. A quick and easy process via the website has streamlined the booking process. Deposit payments can be made online if required via the secure payments system. All bookings are passed directly to the Tradestands Secretary who allocates space and ensures a trouble-free booking process. Contact Jacki Wright for any queries or book online now. The year 2013 sees the 150th Anniversary of Heckington & District Agricultural Society. We aim to celebrate this special year in our history with special classes and events at the 2013 show. Completion of the conversion works for the Society Office"
Monday 24th July: The ground continues to improve and this week's sunshine is making a big difference to the show-field. The marquees are being put up, marking out of the trade-stands took place over the weekend and we are all set for a bumper show. Online Advance 2 Day Ticket sales close Tuesday evening at 9pm, so make sure you get your order in time for posting. You will still be able to buy Advance Tickets from The Pet Shop on the High Street in Heckington until 5pm on Friday 27th July. Single Day Tickets are available on the gates as you come in. Saturday 21st July: As weather improves, Heckington Show’s decision to proceed looks as though it will pay off. This will be the third time in 10 years that UK outdoor events have had a difficult year, but its also the third time that Heckington show will go ahead. We have been lucky with the weather each time, but the credit for getting the event up and running must go to the enthusiasm and determination of the Heckington volunteers who are able to deliver when others struggle. This year we have planned well in advance and are ready for our visitors - with almost 50% extra car parking space available if required - and the parking is still free! Monday 16th July: The Show goes on - As events all over the country cancel or are abandoned, Heckington Show organisers confirmed this weekend that rumours of cancellation are completely unfounded and that it is fully-intended to have the show. Committee chairman Charles Pinchbeck said "We learnt a lot from 2007 when we managed to put on a great show when so many others had to cancel. Since then we have worked with the landowners to improve the drainage of the field and that has really paid off. We have also watched and learnt from the lessons from other events such as the Great Yorkshire Show. Heckington Show is so speical to the village there is a real determination to make it succeed". Thursday 12th July: There are no plans to cancel this year's show, which is going ahead despite the unprecedented weather in recent weeks. A Chance to Win Tickets to the Show! Car stickers are now available from a number of shops in the village. Put one in your car to help advertise the Show and you will be automatically entered into the weekly prize draw to win a pair of weekend tickets to the Show. The Sleaford Standard will photograph a car number plate each week and the owners of the car can claim their FREE tickets by visiting the Standard offices in Sleaford! It is with a sense of deep loss that I must tell you of the passing of Bryan Marshall - the motivation and prime mover behind the Heckington Show Tractor and Vintage section. We have all lost a dear friend, but along the way we found many happy times and memories. I first met Bryan when i moved into the village at the Nags Head in 1997 when I casually asked if anyone was interested in vintage tractors, and thus began a friendship and trail of laughs, labours and tears that I, and many others will remember. Curly Coated Pigs: The curly coated pigs had a litter of 10 piglets on 16th March 2011 & some of the piglets came to the show. The Band From County Hell performed in the Concert Marquee. This local group are a five-piece Celtic rock band and have been described as one of the most exciting and original Celtic bands on today's circuit. Main Ring Attractions included Medieval Jousting, FMX Display Motorcycles, 95th Rifles & everyone's favourites - Terrier Racing! Countryside Area: In its 2nd year, the Countryside Area (located adjacent to the vintage ploughing displays), was even bigger and better. With demonstrations and hands-on experience of countryside pursuits. Follow the link on the right for more information. The Green House: In partnership with SustainNK. North Kesteven District Council's Sustainability Team teamed up with nine organisations to provide fun activities plus advice on everything from council projects and services to green building techniques, generating your own renewable energy and the financial incentives available to all. A Grand Day Out Heckington Show promises to be a truly Grand Day Out with something for all the family. Bring the children, bring the grandchildren and bring the parents. Come to a day out with a difference. Explore our website to find out what Heckington Show has to offer. An inter-club event with two races especially for the U16's - a Team Sprint and an 8 Lap Scratch Race. Both promise to bring excitement and thrills to the unique grass track at Heckington. Full details an application forms for these and all other events can be found on the relevant pages. Over 24,000 people enjoyed the 143rd show. Held as always on the last weekend in July, Heckington Show has grown spectacularly since the 1980s. It continues to be produced and managed by volunteers – a talented and passionate group willing to give the time and energy required to make this Britain’s biggest village show. This committee of some 50 men and women operate as Heckington & District Agricultural Society (a registered charity) with each member taking on a specific part of the show as their baby. Thus for example we have historians running the heritage zone, farmers the livestock, PR people on the publicity and surveyors the layout. This is the perfect combination – enthusiasts working together with experts – and it shows. Heckington Show is an infectiously happy place for our visitors who are able to enjoy events ranging from the spectacular (main ring and firework concert) though the fascinating (heritage village and interactive children’s zone) to the traditional (livestock and vintage farm machinery at work). It all takes place on ancient grounds, shaded by fine trees - all in the shadow of the magnificent tower of the village church of St Andrew and the unique 8-sailed Heckington windmill. The result is the atmosphere of the quintessentially English village show offering the facilities, events and entertainment we all expect in the 21st century. And there really is something for everyone – it’s the place to take your children and your parents! 144 Olympic YearsHeckington has seen some illustrious competitors in the past including none other than Seb (now Lord) Coe, Victoria Pendleton (one of our golden girls in Bejing) and Harvey Smith (that irascible showjumper). Interest in both the athletics and cycling events is huge – the colourful scene as 200 runners set off on the 10 mile road race will certainly stick in the memory and as the London Olympics draw nigh we expect an even greater entry this year. The main ring forms a natural banked grass track and cycle racing has been documented here since the day of the Penny-farthing. The cycle races range in distance and style, with many opportunities for riders to win prizes but the National Grass Track 8km event is by far the toughest of them all.